The Cottage on "Tintookie Vineyards" sits on a slope in the middle of a 17 ha property in an area called Blewitt Springs, in the heart of the McLaren Vale Wine district. It is an open plan house with lots of light and views from every window. The bedrooms are a reasonable size, one with a queen size bed and the other with a double and a king single bed. The main room is quite spacious with a kitchen, pantry, dining area and a TV/reading lounge area. It is in a very private and serene setting with wonderful views down the coast and as far as Rapid Heads. It is surrounded by trees, vineyards and bird song. There are lovely outdoor areas for eating or sitting and relaxing. We would encourage guests to wander around the property and take in the views and maybe pat our curly coat retriever and lovely milking goats. We are less than 10 minutes from McLaren Vale and less than 5 minutes from great wineries, restaurants and coffee. Wine, dine, walk, ride or just sit and read or enjoy the peace and take in the view. Blewitt Springs is about 45 minutes from the CBD but very rural. If you are coming from the city, come up Flagstaff Hill Rd and through Clarendon. A shorter drive and way more picturesque. Hi, I am a viticulturist who is lucky enough to own and run a beautiful 40 acre vineyard in Blewitt Springs, McLaren Vale. My husband and I and our 2 daughters have lived here for 27 years. I also have a love of cheese and cheesemaking and at present own 3 milking goats, one of which I am currently milking daily. We built the house when we first moved here and lived in it for 8 years before my fabulously talented architecture husband got his way and built us a new home. This is a very comfortable house to stay in and enjoy all the benefits of country living. The views are fabulous and the sound of constant birdsong is a joy. The bathroom has a medium size bath with the shower over it. The lavatory is also in the bathroom. Beautiful quality bamboo/cotton or just cotton depending on the season. Plenty of parking outside the house. NBN Wifi. Not as fast as the city but much better than our previous dongle. Full size fridge with a freezer at the top. 4 ring gas burner stove top. Small convection oven, big enough for a roast. Stove top and French press of varying size. Basic pantry items. Pepper, salt, olive oil, balsamic vinegar, tomatoe sauce and a few extras. Not really a games room but plenty of cards and games. You have your own private front, side and back garden, all unfenced. Plenty of trees and great view to the hills. Lulu is a lovely host. The cottage is very well set up and every little thing is thought of. This was our second visit and won’t be the last. We love the place. Once again it was a pleasure having you to stay. It is always a pleasure to share our beautiful part of the Vales with such lovely guests. Enjoyed our time at Tintookie, Lulu was an excellent host and our young children enjoyed milking the goats. The views of the vineyards were gorgeous! You were lovely guests & it was a pleasure having you all to stay. Lovely spacious cottage about 10 minutes away from McLaren Vale but a world away from any stress!!! Very well provisioned with everything you need. Super comfortable bed, good shower, great bbq, gas heating as well as AC. Thanks for your lovely review Sally. We love where we live and it is always great to share it, especially with guests as enthusiastic and as nice as you and Al. Best guests ever! You are very welcome back anytime. Thanks Kate. I love sharing our beautiful property with others. Great guests by the way! Lulu has prepared a tasteful decor throughout with all fittings of a high standard. The bed linen is as new, the bathroom with bath appears new and there are up to date touches such as free wifi and a Bluetooth music player as well as a player for the collection of DVDs. She provides home made bread and a bottle of their own wine. The cottage is within the vineyard with a glorious outlook over the vines as far as the eye can see. It has high chapel type ceilings which contribute to a feeling of airiness and spaciousness. Her pantry is stocked with items for use and every utensil and appliance imaginable. All the walls have collections of original paintings which delight with their quality. The heating is so efficient that even when the winter temperatures were very cold we were snug and cosy. There is a fully equipped laundry. Everything was scrupulously clean and tastefully selected with colour coordinated rugs on the floors. Board games and jigsaws were provided. The lounge sofas are comfortable and also convert to beds. Flowers greeted us and a blue wren and his jenny came close to the door. Rosella parrots gave a splash of colour. 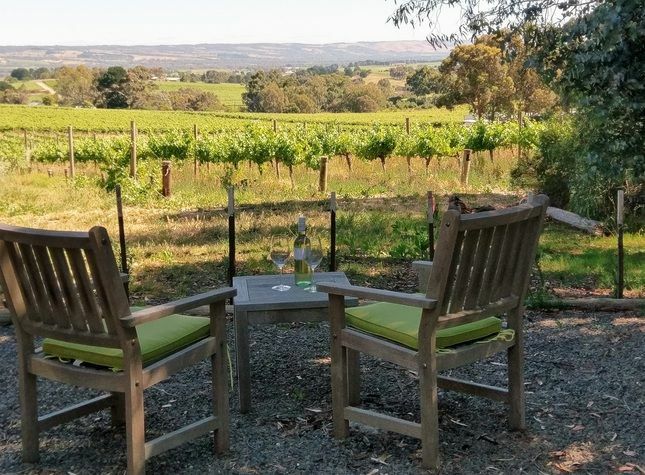 Outdoor chairs and tables with a view over the vineyard would be lovely to use in warmer weather. We also enjoyed walking around and exploring the property. All in all we were so happy with everything that it has been a joy to be able to write this in appreciation and gratitude to Lulu. Comfortable house in picturesque location. Good facilities and immaculately clean. Well set up and perfect as a base for touring the region’s cellar doors. We were there for three nights and would have liked to stay longer. Lulu was very helpful, and the house had everything we needed. Great view, great eggs! Thanks Charles, it was a pleasure having you! There are plenty of Cellar Doors and Restaurant's within a 10 minute drive.